Stir-frying requires a bit more from the cook than your average culinary technique. It demands organization and a hefty amount of prep work. Dinner happens in a flash with lots of sizzle and steam. The aftermath, lots of prep bowls, mere minutes ago filled with a little bit of this and some of that, need a bit more attention. My husband cringes when it’s Asian night in our home. The dishwasher of our partnership, he dutifully cleans up after every meal, and I, in gratitude, try to clean as much as I can as I go. On Asian night however, it’s all saved for the end. My bowls of ingredients, carefully lined up in the order in which they will go into the dish, are quickly emptied into a blistering wok and then stacked haphazardly by the sink as the house fills with the aroma of ginger, garlic, and soy. For this reason, when I pull out my wok, I aim to make something so good that my husband doesn’t bat an eye at the dirty dishes that await him. 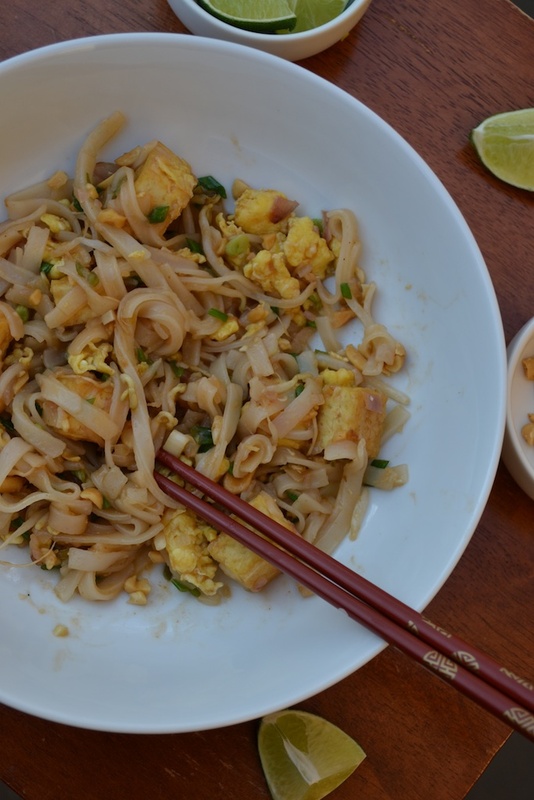 This is tricky, since he truly hates the dishes, but this Vegetarian Pad Thai with Baked Tofu rises to the challenge. When I worked as a line cook several years ago in a local restaurant, I learned a trick to getting crispy tofu. You drop slices of tofu into a fryer for a couple of minutes before removing them and letting them drain on a wire rack. You then refrigerate the fried slices before frying them again right before serving. The result is crispy, flavorful tofu that holds its own in any dish. Twice-frying tofu is a great solution if one is in a restaurant and has access to a perfectly heated fryer. At home, it’s not so ideal. For most home-cooks, deep-frying is intimidating, messy and greasy. Baking tofu yields similar results without the hassles of frying. Firm tofu is simply pressed between two plates for about one hour before being cubed, tossed with a little oil, and baked in the oven for 40 minutes. The resulting golden-brown cubes are crisp and flavorful and, like fried tofu, they hold up well even after being tossed about in a stir-fry. Your local grocery store will stock most of the ingredients for Pad Thai in the international aisle. Tamarind, however, will likely throw you for a loop. Some well-stocked grocery stores and many international markets carry it in pod form. I’ve made the sauce starting from the pods and it is a lot of work that yields only so-so results. Tamarind pulp, sold in a pliable block, is found in any international market and is worth purchasing. It merely requires you to scrape off a chunk and the remaining pulp can keep for months tightly wrapped in the refrigerator. It’s worth a special trip to your local international market to purchase it. And finally this dish requires you to ignore the plight of the dishwasher. Execute your prep, cook the dish, and then let the first bite convince the diner that washing the dishes are the very least that he or she could do. This classic Thai dish has lots of ingredients, but cooks very quickly. Be sure to prep everything before you start cooking. To make the baked tofu: Preheat the oven to 400 degrees. Remove the tofu from its packaging and pat it dry with paper towels. Wrap the block in clean paper towels and place on a clean plate. Put another plate atop the tofu and place a can or weight on top of the plate to press it down. Allow it to sit for 25 minutes. Unwrap the tofu and re-wrap it with fresh paper towels. Return the tofu between the two plates and weight it down again for another 20 minutes. 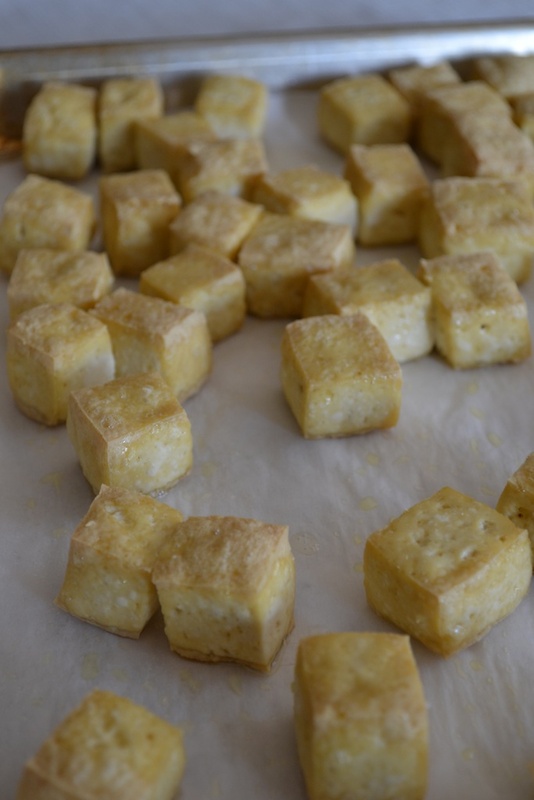 Unwrap the pressed tofu and cut it into ½-inch cubes. Toss the cubes with two teaspoons of vegetable oil. Line a small baking sheet with parchment paper and spread the tofu out on the baking sheet. Bake for 40 minutes until golden brown. Set aside. To make the pad thai: In a small bowl, pour the boiling water over the tamarind pulp. Stir and smash the tamarind pulp until it softens and a paste forms (about 5 minutes). Strain the mixture through a fine mesh sieve and discard the solids. Pour the strained tamarind liquid in a saucepan and stir in the brown sugar, fish sauce, and salt. Bring to a boil then reduce the heat to medium-low and let simmer briefly, stirring constantly, until the sugar dissolves. Put the rice noodles in a large bowl. Cover with boiling water and allow them to soak for about 20 minutes or until al dente. Drain the noodles and set them aside. In a large wok, heat two teaspoons of vegetable oil over high heat. When hot, add the egg and cook briefly until the egg is cooked through and scrambled. Remove the egg from the wok and set it aside in a medium bowl. Add the remaining 1 tablespoon of vegetable oil to the wok. When hot, add the garlic and shallot. Sauté until the garlic is lightly browned. Add the baked tofu and sauté briefly, about 1 minute. Remove the tofu and shallot-garlic mixture with a slotted spoon and put it in the bowl with the scrambled egg. Add the tamarind sauce to the wok and bring to a boil. Add the drained noodles and cook for about 2 minutes. 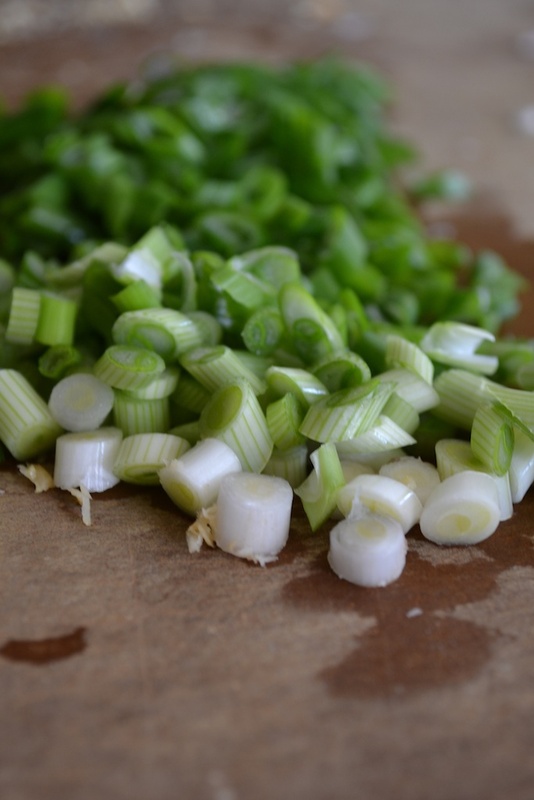 Stir in the green onions, ½ of the peanuts, the bean sprouts and sriracha (if using). Cook the noodles for another minute or until they completely absorb the broth. Stir in the tofu-egg mixture and toss to combine. 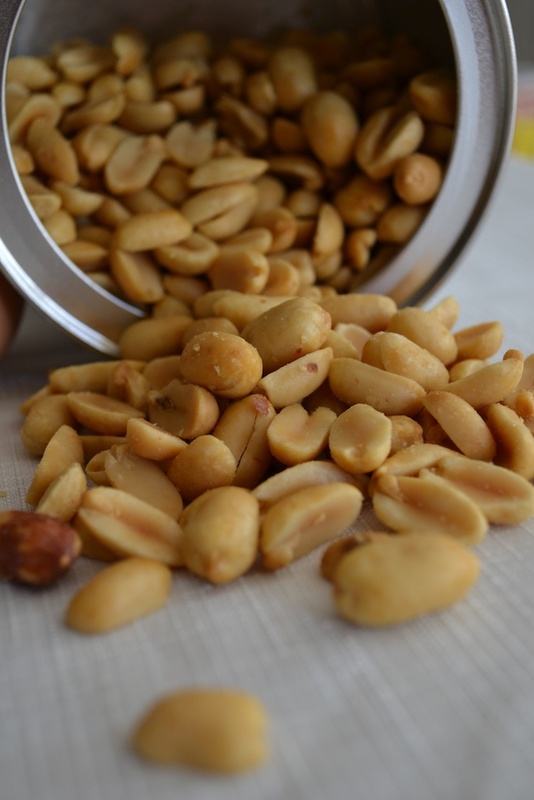 Serve immediately sprinkled with the remaining chopped peanuts and lime wedges. Have your satisfied guests do the dishes.